I first heard of Browhaus from a friend. She told me once about her Serendra branch experience and was so overwhelmed by how the therapist had re-drawn and re-shaped her brows to make it look tamer and thicker. So when the buzz came in town that Browhaus will be threading soon here in Davao, I thought, wow, finally we’ll not be flying to Manila anymore to get our brows styled and polished. Sadly, I wasn’t able to come during the opening because of my day job. But the brow goddesses might have heard my prayers and thought - this woman needs some brow polishing and granted my earnest plea. 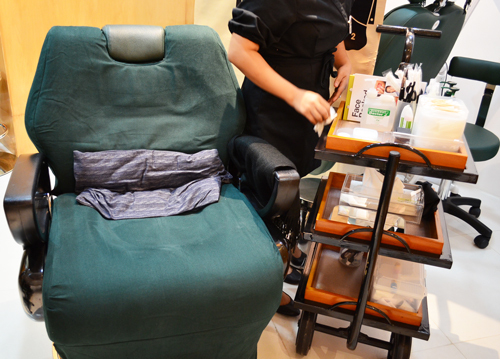 Browhaus in Davao is conveniently located at the third level of Abreeza Corporate Center in Bajada. I came in early so there weren’t any clients on board yet. 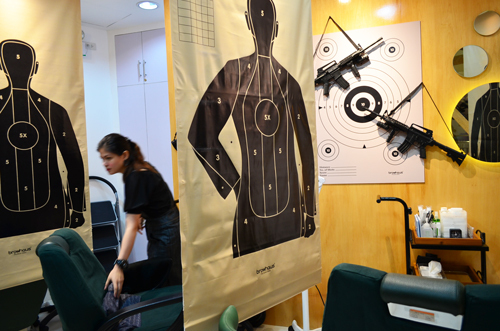 The salon ambiance of sniper rifles and faux human targets hanging around just amused me. 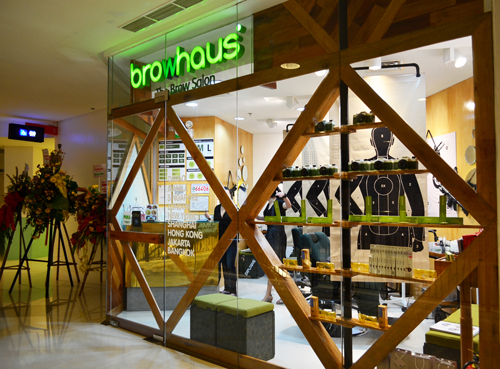 When I asked Monique, the Sales and Marketing Head of Browhaus why they came up with such a concept, she said it’s their head office that conceptualized the design symbolizing proficiency and precision of their service and hitting their sales target right on the dot here in Davao, clever creativity isn’t it? I have tried having my brows threaded with other salons before and it felt kind of pinchy painful. But Monique was quick to assure me that with Browhaus it isn’t as painful and when in fact it’ll get done before I even knew it. So then, I was introduced to Dana, my brow therapist. She’s a local and comes from Toril. You can tell her all your brow worries and she’d be more than willing to tell you what shape goes perfectly well with your facial contours. Dana has the lightest hands in the world, it's just as if she's not touching your temple at all, very skilled professional. Browhaus also uses sterile, specialized materials and tools, hence you can be sure of your safety and hygiene. And this is where the action has taken place, this beauty seat is so comfortable, I so love it. True enough, it wasn’t as painful as I thought it would be. It only took Dana close to 15 minutes to finish my ‘classic threading’ and lookie! Got a polished brow all done quick with precise professional touch and just the docile arch I wanted it to be. Other than the classic brow construction, Browhaus also offer premium services on brow resurrection, it’s a unique process that recreates a natural life-like brows using advance brow technology and employs long lasting dyes that never fades away. 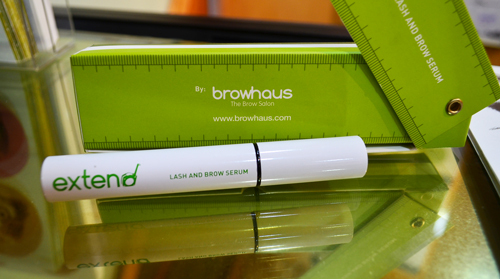 Browhaus also develop their own unique in-house products to ensure safety and quality, one of which is their Extend lash and brow serum. When applied, it works to extend your lashes and brows like they were the most natural hair in the world. Today, Browhaus is serving the world, they’re at Singapore, London, New York, Shanghai, Hong Kong, Manila, Jakarta, Davao and more in the works. 50% off on all ala carte services for this month, so hurry and grab this opportunity today. Kevin, I can even go to Mars all in the name of my brows.. hahahah... thanks for dropping by. I have my brows done in the salons here in Dubai via threading. I just love the way the Indian attendant does my brow threading because she does it fast and painless too. I'm amazed that even months after, the growth is minimal and my brows are still in great shape. I'm glad that there are brow salons in the Philippines so when I come home, i don't have to worry about plucking my very bushy brows. I have tried brow threading once, and I cried. It was too painful. That was the first and last. Beauty regimen shops are really getting very specific in their services which is good since we can except experts to be handling customers. At first I thought it is a gun store. Eager pa naman akong pumasok sana. But wait, for the girls na naman pala. Maganda naman ang kinalabasan ng eye brow mo. Wow, this is where I need to go lol. MY brow is chaotic. Hello Raya, definitely Ray, you should come and visit them. How much is brow trimming?